First thing that people, especially the youngsters in love do when the winter month February approaches is tallying the valentine date sheet. This sheet contains information about the 7 magical days that precedes the valentine day. Each day is special and on each day you are required to do a unique activity that helps demonstrates love. Many of you might be aware about the V week. However, it seems as if you have some confusion about the love date sheet. This is the reason you are here to solve the same. Therefore, we are all set you solve all your queries so that you can make the most of this love week. In this article we are going to give you the thorough know how about the 7 magical love days of valentine week with valentines date sheet. The first day of the love week is the Rose day. You ought to gift roses to the person you have feeling for. Depending on your feeling and the form of those feelings you usually gift red, yellow and pink roses to the other person. The former is obviously for the ones you are in love with while the other colours are a way to respect and approach the friendship you share with other person. Do not forget to write rose day messages and quotes on the bouquet you are planning to give. Next on the valentine date sheet is the Propose day. As the name suggests, on this beautiful love day you need to approach the person you have feelings for and confess your feeling. This day gives you an opportunity to get committed with the love of your life. Plan the special day at a beautiful venue and pretty settings. If you are hesitant to confess your feelings you can take help of the beautiful valentine’s greeting cards and write your proposal or the love message on the same. As evident from the name on this day you ought to give chocolates to people you love. For your girlfriend or your wife, boyfriend or your husband you can make an extra effort. You can search for the chocolates that are heart shaped. You are usually able to find heart shaped chocolates and chocolates with love messages like I love you in the market during the valentine’s week. On Teddy day you ought to give your loved one a teddy bear, small or big. This bear has a great role to play in the life of lovers. Love birds usually name these teddies and use them as your substitute. People hug them in the absence of the person who gave it, talk their heart out to them, share emotions etcetera. You must go in for buying one of the cutest teddy bears in the market for your loved one. On the promise day you are supposed to promise your loved one something. It need not be a promise too intense or too hard to keep but just a cute promise. You can promise your loved one a lot of things. You can promise to love her/ him dearly always, promise to be by her/ his side n thick and thin, promise to be honest, promise to care etcetera. So make the best use of the opportunity and get the valentine day greeting card or make it yourself and jot down the promise message on the same. This is more romantic than you think. Hug is gesture of love that helps you express the feelings of love and affection for others. On this beautiful day of the V week, you are supposed to hug the other person. The duration and intensity of hug needs to vary so that you can demonstrate the feeling that you actually want to. While friends hug lightly, lovers go in for tight and long hugs, friendly hugs are short and less intense while love hugs are very intensive. The day prior to valentine day and the last day of the valentines week is the kiss day. As lucid from the name you ought to exchange kiss with your loved ones. while friends and family usually kiss on forehead, cheeks and hands, the lovers share kiss on the lips that is considered to be the most intensive form of love. 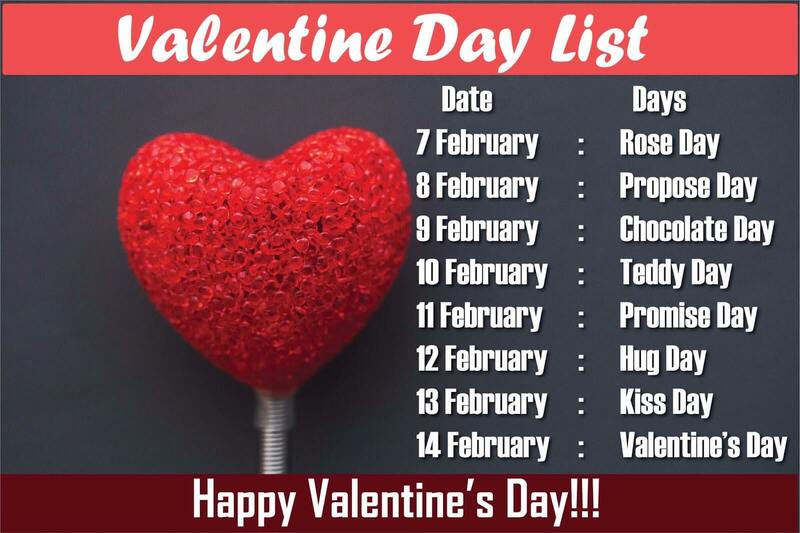 Finally on February 14th comes the most awaited valentine day. On this love day you need to make special arrangements. You ought to have a greeting card with the best love message. Also, you need to have a valentine gift, a dinner planned and anything more that you wish to do. For valentine day gift ideas for him and her you can go through our guide. 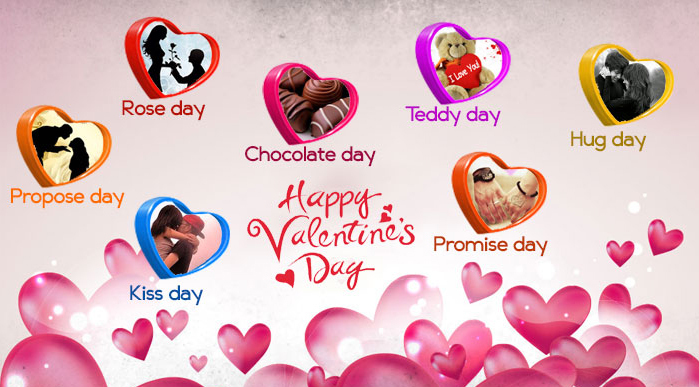 All in all, these are the 7 magical love days of valentine week with valentines date sheet. Though it is usually believed and true that there is no particular day to love, yet the valentine weeks give you an opportunity to spare time from your hectic schedule so as to make the other one feel special as celebrating valentines week has become a custom among the youth. So make the best of these days and make each valentines week love day special.